Dr. Kulkarni received his undergraduate degree at Rensselaer Polytechnic Institute in Troy, New York and his medical degree from Albany Medical College in Albany, New York. Upon completing his internship and residency at MetroHealth Medical Center in Cleveland, Ohio, Dr. Kulkarni obtained his specialty training through the University of Florida at Shands Medical Center and Malcom Randall VA Hospital in Gainesville, Florida. 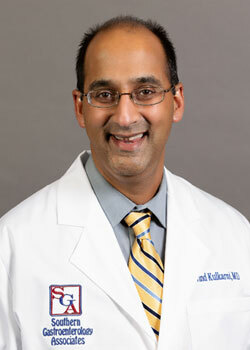 Dr. Kulkarni is board-certified in both Internal Medicine and Gastroenterology. He currently serves as Clinical Assistant Professor for the Philadelphia College of Osteopathic Medicine, Georgia Campus. He is a member of the American College of Gastroenterology, American Gastroenterological Association, American Society of Gastrointestinal Endoscopy and at the American College of Physicians.